The Sporadic Island of Skopelos owes some of its fame to the fact that it was used as the setting for “Mamma Mia”. It is the second largest of the Sporades after Skyros, and also one of the very lushest Greek islands; 80% of its hilly landscape is covered by pine forests and olive and plum groves. Skopelos Town is very picturesque with colourful roofs covered by blue slate and red tiles and overlooked by a 13th century Venetian fortress. Its long waterfront promenade is lined by restaurants, bars and shops in the shade of plane and mulberry trees. Outside Skopelos Town there are hardly any building developments, as the conservation of nature is a priority on the island. This is also the reason why the inhabitants of Skopelos have repeatedly voted against an airport on the island. You can get to Skopelos Town or its other port of Loutraki via ferry from Skiathos that does have an airport and is served by international charter airlines. Skopelos is famous for its exceptionally beautiful beaches and there are plenty of opportunities to swim from the pleasant bays in the southern and western parts of the island. Kastani has become the best-known beach on Skopelos, because some of the scenes in “Mamma Mia” were produced on that beach. The best way to get to less busy beaches is by hiring a boat, and many holiday-makers take advantage of this opportunity to get to their own ‘private’ beach. Glossa, the only mountain village, is situated in the north of the island, but in general, life on the island centers on coastal areas. The most beautiful resorts on the Sporadic Island are Agnontas and Skopelos Town. Panormos is a bit too small for a holiday resort, but it does have a few taverns and bars and a very attractive bay, even if accommodation is a bit sparse – there are very few holiday apartments and hotels. Skopelos has plenty of woodland, space for natural environment, lovely beaches and pleasant resorts – for many people the perfect combination for a holiday. Agnontas is a beautiful little harbour village on the Sporades Island of Skopelos. In recent years it has been extended into a ferry port to replace the one in Skopelos Town, as the bay at Agnontas is more sheltered. However, unless you are there when a massive ferry arrives, you wouldn’t even know. The village and its small beach are simply picturesque, beautiful and romantic. Sharing the space around two small jetties are some small fishing boats and the leisure boats of the locals. Around the beach there are a few very good fish taverns, reputedly the best on the island, and a pleasant beach bar. Agnontas is lovely for a day trip. Elios (Neo Klima) has a fairly big and modern yacht harbour. Whenever a group of sailing boats arrive, Elios perks up and becomes active. When they are gone, it relapses into the quiet and sedate state so typical of a Greek island. In the vicinity there are a few nice beaches and pretty hotels, whereas the resort itself is rather down-to-earth. Along the main road there are a few taverns and shops. 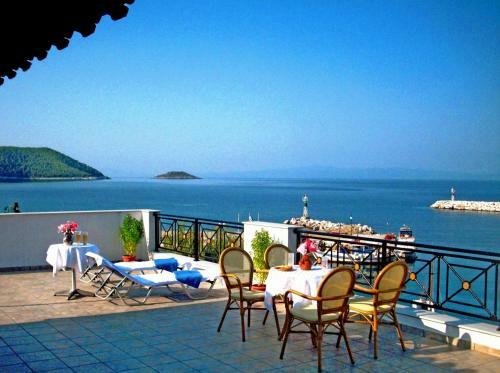 Glossa is the biggest inland resort on Skopelos. 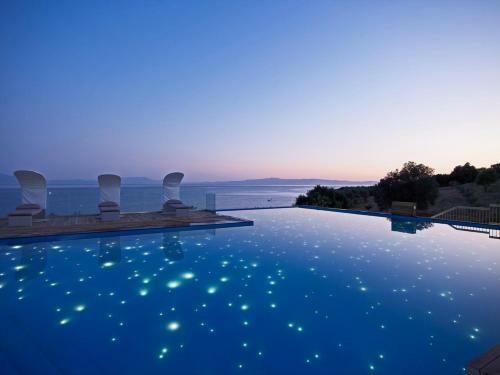 The small town is situated in the north of the Greek Island and offers a spectacular view of Skiathos. Glossa itself is rather inconspicuous. It has a few bars and taverns, some shops too, and apart from that just peace and relaxation. In the centre a few houses are up for rent. Those in search of traditional Greek village atmosphere will find what they are looking for in Glossa. Loutraki is the ferry port of Glossa on the Sporades Island of Skopelos. It is one out of three ferry ports on the island, and the first stop for ferries coming from Skiathos. The resort is a pleasant collection of bars and taverns, all on a very small scale. Accommodation is available too, and life moves at a slow pace in Loutraki. The bay of Panormos is one of the most beautiful bays on the Greek Island of Skopelos. All along the crescent-shaped beach there are deckchairs and sunshades for hire, and there are some very nice bars and taverns as well. Yachts frequently anchor in the natural harbour and the hotels in the area offer a fantastic view of the bay. Directly off the coast of Panormos lies a small island, where holiday-makers can go by hire boat. The island not only affords a stunning view of the nearby coast, but is absolutely quiet. There are two exceptionally beautiful beaches in the vicinity, one of them Kastani Beach where scenes of “Mamma Mia” were filmed. Panormos also has a small but well-stocked supermarket. For a beach holiday, Panormos is the ideal place. Skopelos Town is situated on the east coast of the Greek Island of Skopelos and has a population of approximately 3000. The small town nestles into the hillside around the harbour bay. In the town centre there are numerous beautiful garden taverns and bars, and taverns and bars line the harbour as well and people can sit outside and appraise the evening outfits of passers-by. Even during the peak season, Skopelos offers a very good combination of rest and activity. The bars in town are not swamped with tourists yet, and you still get value for money. Most hotels are outside the town, and there is ample choice for each budget. Those who prefer accommodation in town can rent a town house at a reasonable price. The small settlement of Stafylos has been built around one of the most beautiful beaches of the Greek Island of Skopelos. It is named after the mythical Prince Stafylos, whose grave was discovered near the beach. It dates back to 1600 BC and the prince’s sword can be admired in the Archaeological Museum in Athens. The beach itself can be accessed by local bus, private car or on foot. In the area behind the beach there are some very attractive accommodation options and there are a few taverns and mini-markets as well. Stafylos is a holiday resort for beach lovers.